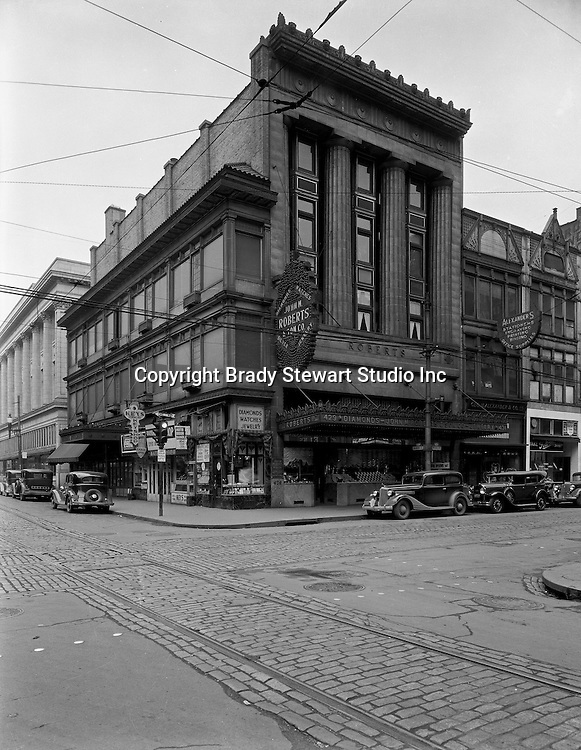 Pittsburgh PA: View of the corner of Diamond and Wood Streets - 1936. Founded in 1832 in a log cabin, John M. Roberts & Son Co. moved to Wood and Diamond streets in 1925. Mr. Roberts was the fourth generation of his family to work in the business. Owners often said it was the oldest emporium in Pittsburgh, the first to use lighting in its display windows, and proudly boasted of customers such as George Westinghouse, railroad financier and philanthropist Diamond Jim Brady, singer Lillian Russell and pianist Liberace. The store closed in 1997, when the building was sold to a convenience store chain, but, at its peak, the company employed 63 people on four floors.